Watermelons are the treat of summer, kids, picnics and seed spitting champs around the globe. But do you know the basics of the perfect watermelon? Here are some facts and information you should know before you pick your next melon. Top quality watermelons are available 12 months out of the year thanks in part to today's global market, and they are especially plentiful during the peak season from April through October. Local growers can be a good source of top quality melons as well as different varieties. Here in Oregon, Hermiston watermelons are prized for their sweetness. There are more than 1200 varieties of watermelon ranging in size from less than a pound, to more than two hundred pounds, with flesh that range from red, orange, yellow or white. In Japan the latest interest has been in growing square watermelons. At over $300 US dollars, it seems a stretch to pay for of a shape that reflects mostly the rind. Wedges: The average 20 lb. watermelon yields about 53, 6-ounce wedges, each 3/4" thick. Cups: There are approx. 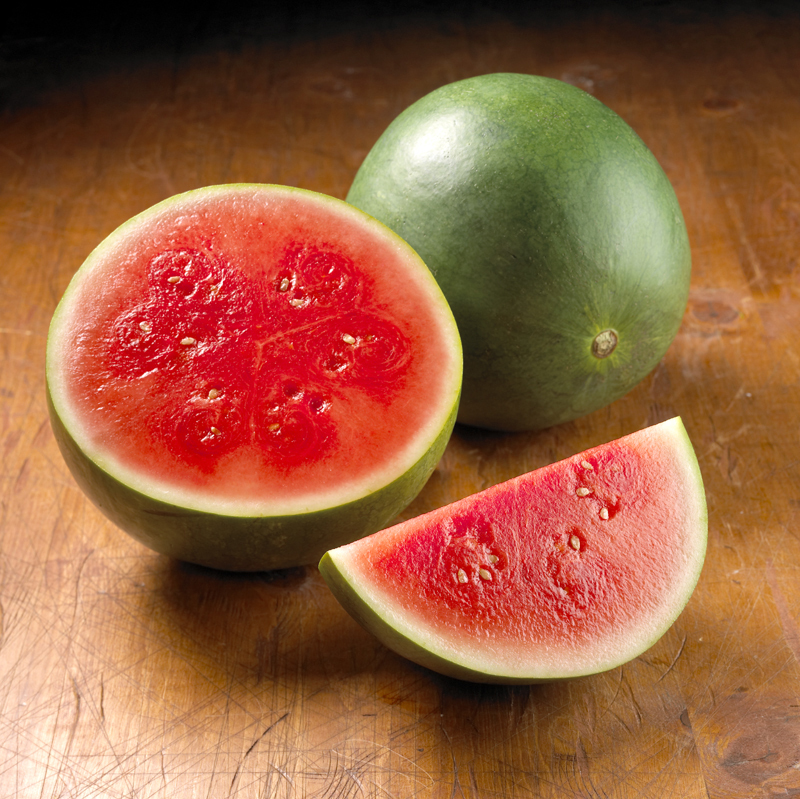 3.2 cups per pound, so an average watermelon yield is approximately 1½, 2-cup servings per pound. Lift it up. 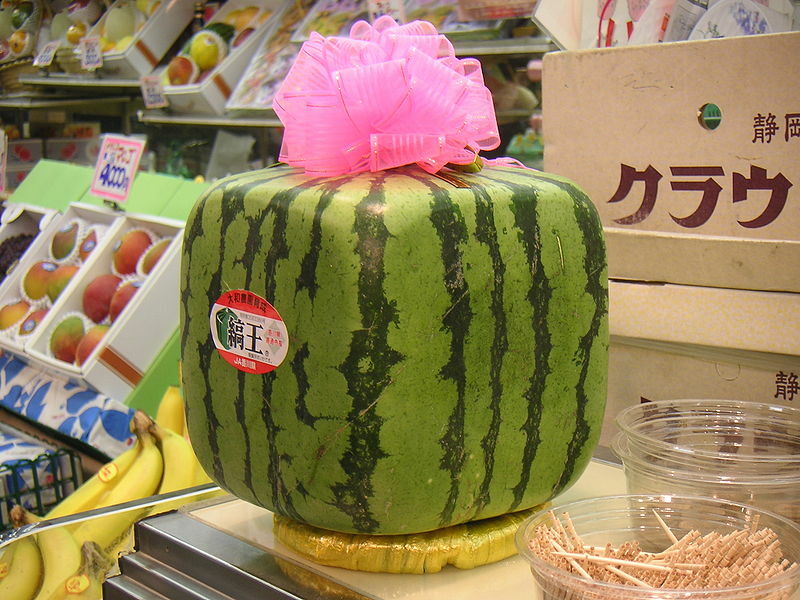 The watermelon should be heavy for it's size. Watermelons are 92% water, with most of that weight in water. Turn it over. The underside of the watermelon should have a creamy yellow spot from where it sat on the ground as it ripened in the sun. Give it a thump.Tap the watermelon with your first finger knuckle. Does it sound dull and hallow? Then it MIGHT be ready for the table. With the "thump" test, it's more of luck then science. If your not sure, try another. And until they make a device that shows the ripeness factor, experience will have to take over. And I can think of no better way to gain "experience" then by cutting one open! Compared to most fruits, watermelons need a more "tropical" climate - a thermometer reading of 55° F is ideal. However, whole melons will keep for 7 to 10 days at room temperature. Store them too long, and they'll lose flavor and texture. After cutting, store watermelon in refrigerator for 3-4 days. 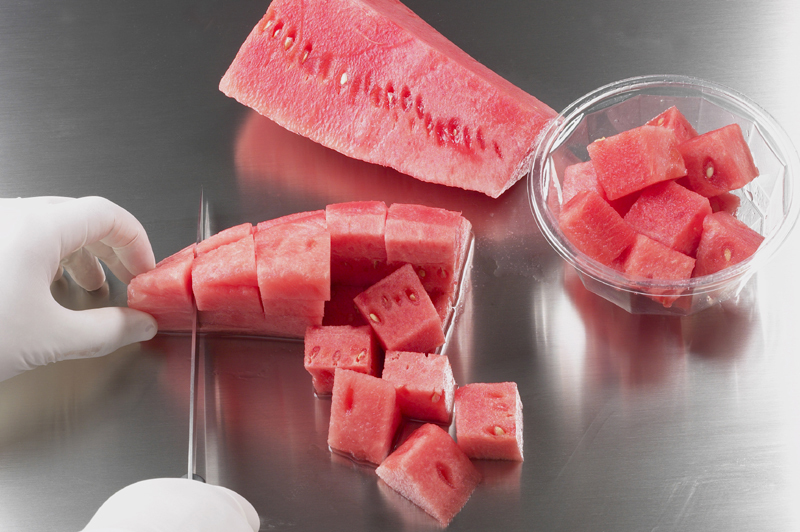 After two days at 32° F, watermelons develop an off-flavor, become pitted and lose color. Freezing causes the rind to break down and can produce a mealy, mushy texture. 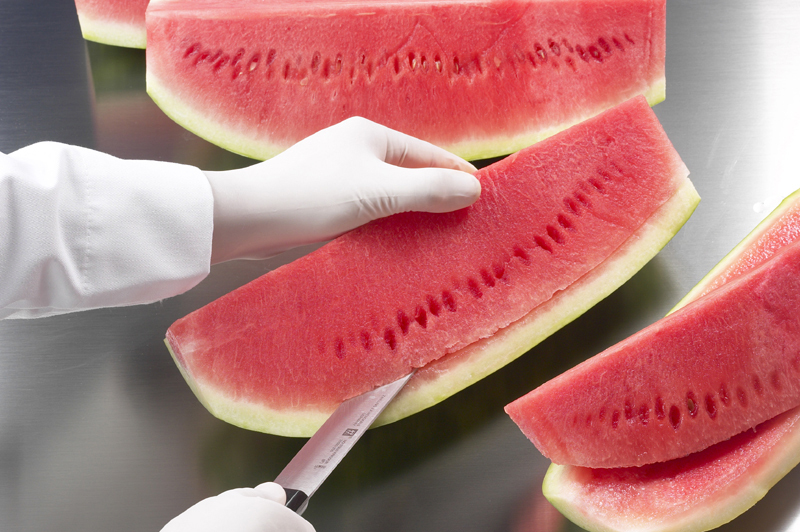 Once a melon is cut, it should be wrapped in plastic wrap or stored in containers and kept at 36° - 39°F. According to the FDA, you should wash all fruits and vegetables, including all melons, in clean, running water before eating them. This is true of all fruits and vegetables, rinds or not. 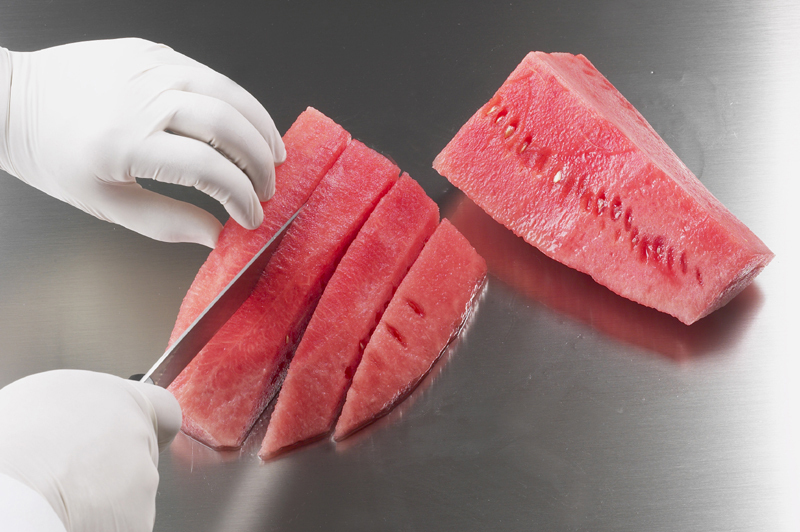 You should also use clean knives and cutting surfaces. Additionally, persons preparing melons, fruits, vegetables or other foodstuffs should thoroughly wash their hands with soap and water prior to preparing the food for eating. But you knew that already...Right? Removing Seeds Is A Breeze!